When you think about countries where the NRC conducts international cooperation and assistance, Tanzania would probably not be the first one that comes to mind; however, that is where a group of five NRC employees recently held a workshop on regulatory practices related to uranium production. In recent years, there has been increased global interest in uranium mining and milling. This has led to a significant impact on countries with limited experience and a lack of regulatory infrastructure and trained staff. As a result, the NRC’s Office of International Programs initiated outreach on this topic to our counterparts around the world. Uranium is a naturally occurring radioactive element that has been mined in the U.S. and other countries around the world for centuries. After being processed, uranium can be turned into fuel for nuclear power plants; however, if uranium mining and milling sites are not properly regulated, the radioactive materials and wastes at those sites can be hazardous for the public and the environment and lead to complex and expensive clean-up operations. Abandoned or unregulated uranium recovery sites where hazards remain after operations have ceased, are known as “legacy sites.” Restoring these legacy sites may require clean-up of contaminated land and groundwater, and activities to reduce contamination from waste piles. With proper strategies undertaken early in the planning stages of uranium mining and milling, countries can take steps to avoid the creating these legacy sites, which are costly and difficult to clean-up. The NRC is providing best practices and lessons learned to its international counterparts who are beginning to embark on uranium production, with the focus on helping to build strong regulatory infrastructure and preventing future legacy sites. 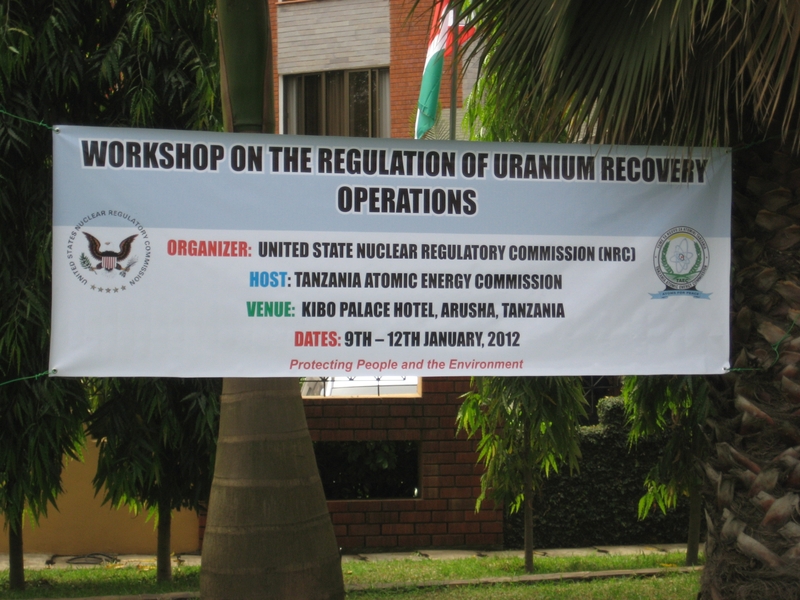 The NRC has hosted three workshops for international counterparts on the “Regulation of Uranium Recovery Operations” in Denver (August 2009), San Antonio (May 2011) and Arusha, Tanzania (January 2012). The three workshops have included participants from 31 countries from Central and South America, Asia and Africa. These workshops facilitate the sharing of best practices on the regulation of uranium mines and mills, including regulatory framework (laws, regulations, and guidance), application review, licensing process, oversight and inspection, cleanup, and decommissioning. The workshop presenters stress the importance of independent regulatory authorities, well-established laws and regulations and long-term planning related to uranium recovery. Presenters from the NRC, the International Atomic Energy Agency and Canadian Nuclear Safety Commission have discussed the environmental, health, and safety aspects related to uranium mining, milling and decommissioning and have facilitated the exchange of information between workshop participants. The workshops in the U.S. also included tours of uranium recovery facilities and decommissioned uranium mills. Future workshops targeting specific regions are being planned.